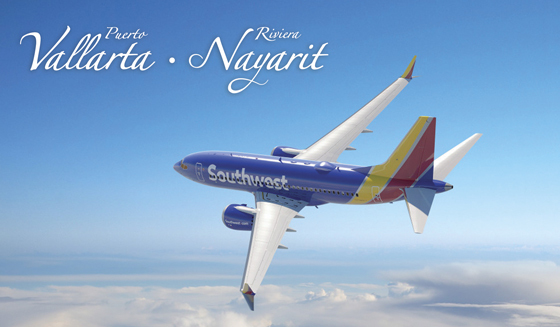 The new flights launched in 2015 by Southwest Airlines to Puerto Vallarta – Riviera Nayarit have been a resounding success, which is why they want to continue sending in flights from more cities in the US. Southwest Airlines announced via press release that it sent a proposal to the US Department of Transportation for a new international flight from Los Angeles to the Gustavo Díaz Ordaz International Airport to being by the end of the year, thus providing additional airlift to Puerto Vallarta – Riviera Nayarit. Should the proposal be approved at the end of June, the new nonstop flight will be daily and year round beginning in November 2016. Gary Kelly, Southwest Airlines’ President and Chairman of the Board, has been very pleased with the results of the Denver, Houston and Orange County flights inaugurated in 2015.